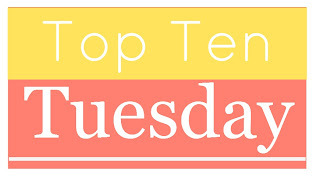 I kind of hate these "top books on TBR" posts. I could use them to "ooh" and "ah" over the upcoming new releases; but, inevitably, I wind up guilting myself into using it as a harsh reminder of all the stuff on my shelves I STILL haven't read. Which in turn makes me feel guilty about all the books I've bought or borrowed from the library. And we all know the list won't help anything. I'm going to sit down with each of these books when I'm in the mood for it (or never) and no list will hurry me along. You may recognize some of these from my last two TBR lists (1, 2). ...Yep. I think the rest are a mix of giveaway wins, gifts and older or out of print titles I tracked down. ......... Wow, this stuff writes itself. You don't even have to try to make me sound like a horrible reader and/or despicable human being, haha. ;) Just thinking about other people seeing this list has the guilt flowing. Yes! Use the guilt, Luke! That's it for this round of 10! Thanks for stopping by and check back in tomorrow for this week's Updates! In which I crocheted a ball. Sort of. Haha, I'm glad I'm not the only one way behind! Stolen Songbird just popped up on my radar yesterday, actually. I have no idea why I had not heard of it before, because it has gotten amazing reviews! I'm excited to see what you think of it. Happy reading! Over half of those are on my winter TBR, too; not my Top 10 one, but my bigger one. Marmell's book should be put on my TBR list for sure. Another series I have put off because it is now four books in. And I liked Wexler's other series so I think i oughta consider that one as well.